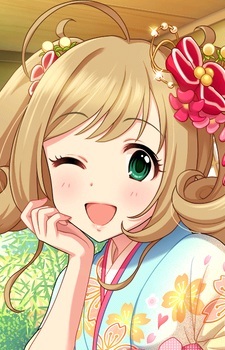 Shin is a quirky girl with a cute personality who likes making her own idol costumes. Her surname means "sugar," while her given name is written with the character for "heart," and she loves to point out her cuteness and sweetness. She also enjoys being called "Sweetie." She is depicted as literally throwing hearts to the audience in two of her cards. Shin is 26, but looks like a teenager. This is mostly explained because her cute idol outfits make her look younger. While her outfits are indeed cute and always are largely pink, if you look closer you can notice some details are held together with tape.